Consumers, bloggers and techno journalists have been predicting the iPhone 5 release date for almost two years now (thanks to last years 4S incarnation). Today all those rumours stop, almost. Apple has put out invites for an event on 12th September 2012 with a cunning iOS style 12 logo. 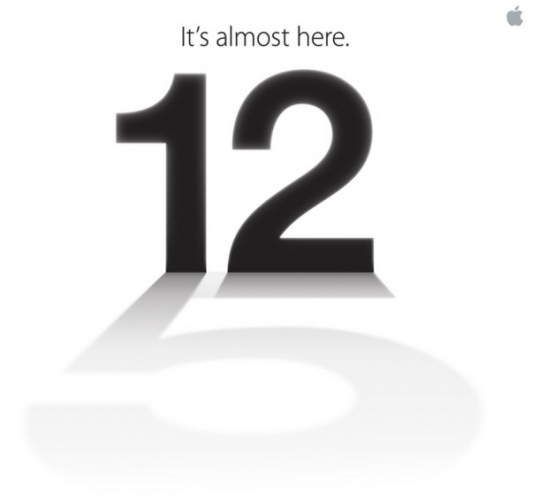 Instead of casting an upside down 12 it shows the number 5; clever Apple spin doctors have just announced the iPhone 5 will be announced on the 12th September. In years gone by various iPhone launches have been just the start of an even longer wait. However the new iPad was announced and put on sale on the same day. This surely means you’ll be able to order, or at least preorder, on the same day. The iPhone 5 is reportedly larger than the current phone, has a larger screen, slimmer design and possibly 4G. Last year Apple also brought in a new team of NFC experts meaning contact less payments may also be included. It has also been rumoured that a newer iPad (see what I did there) will be launched on the same day. This has been touted as the iPad mini, which if real will have a smaller form factor than the current model. Are you looking forward to the launch? If so, will you buy it straight away?